Ever since we created our butterfly garden Minnie has been convinced that there are fairies living amongst the flowers! She loves searching for them, but lately she's become a little concerned that they have no real shelter from the rain! 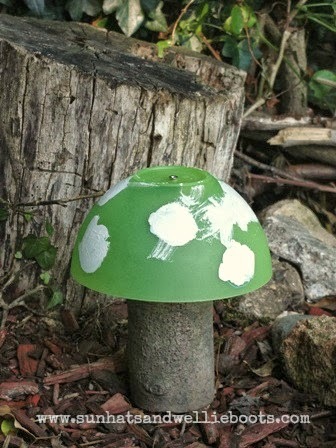 So we thought we'd better create some mini shelters, & came up with these Fairy Toadstools! For the base of our toadstool we cut small logs from a fallen tree branch. Minnie had a go at sawing the branch (unfortunately there are no pics of this as I was supervising). She used a small handsaw, & under my close supervision she slowly cut along the branch. 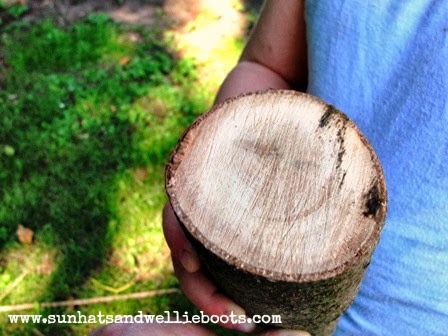 She was fascinated by the different textures of the log, & it's smell! I pointed out the rings in the wood & we tried to work out how old the tree might have been by counting the rings. 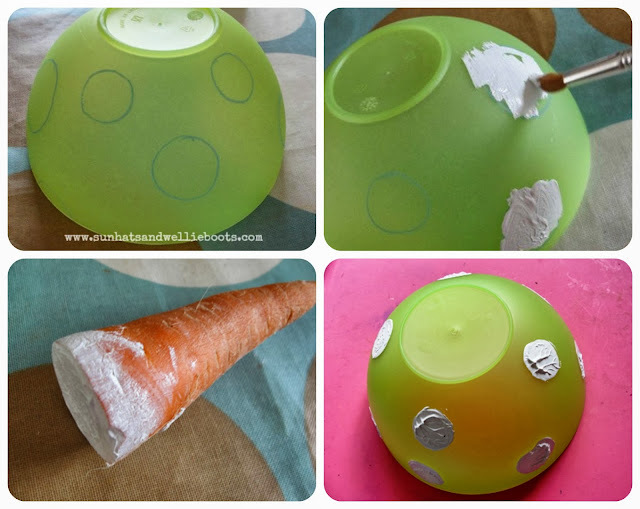 When our bowls were dry I made a hole in the base of each using a bradawl. Then Minnie (with a little help) used a screwdriver to attach the bowl & log together. When she had finished, Minnie headed off to the butterfly garden to arrange her toadstool shelters. This was a great activity to explore shapes, especially circles, with the circular prints on the bowls, the circles in the wood, & circular motion when using the screwdriver. 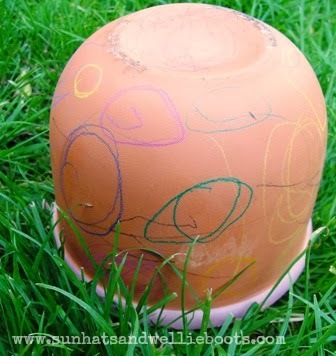 Minnie found some terracotta flowerpots & started drawing on them with coloured pencils! The great thing about these pots is that the colour doesn't run when the flowerpot gets wet, so the pots can stay outside in the rain & retain their colourful design! Genius! 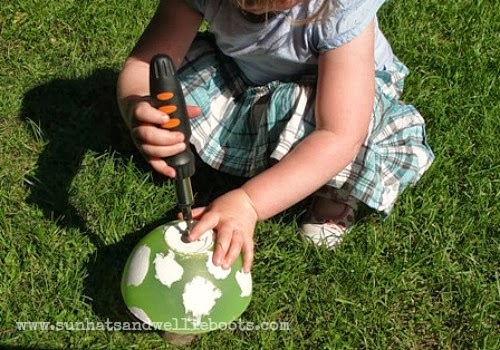 Another way to create a garden toadstool! These toadstools have been offering a little shelter to wildlife too, with ladybirds & spiders sheltering beneath! 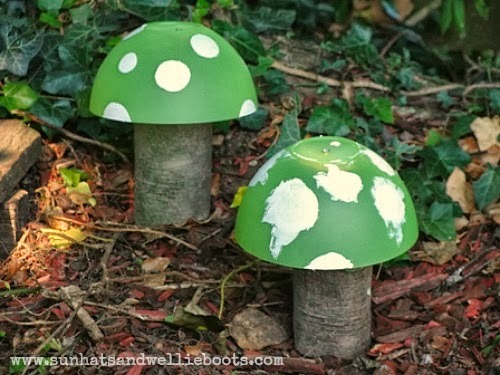 So many discoveries & new experiences were had creating these fairy toadstools. They're now a firm favourite to explore & play with in the garden regularly. Mini Fairy Herb Garden, or Fairy Doors.